The Taiwanese electronic maker, ASUS has announced the launch of its Eee Pad Transformer TF101 tablet. The Eee Pad Transformer is aimed to those users who look for media consumption and mobile productivity in an elegant yet versatile design. 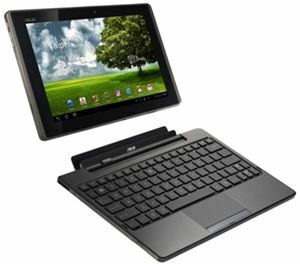 The ASUS Eee Pad Transformer has been featured with powerful and responsive Android 3.0 Honeycomb operating systems. The tablet has been enhanced with ASUS’ intuitive Waveshare user interface for content creation, social communication, high-definition media playback and smooth realistic game play. 10.1-inch IPS Panel with LED backlighting, 1280 x 800 resolutions, 10 finger multi-touch support and scratch resistant Corning Gorilla Glass. Runs on Android 3.0 Honeycomb operating systems. NVIDIA Tegra 2 dual-core processor. 5-megapixel rear and 1.2-megapixel front cameras. 16GB to 64GB of storage with a Micro SD expansion slot. Supports 802.11 b/g/n and Bluetooth enabled. 2-in-1 audio jack (Head Phone / Mic-in) and 1x mini HDMI 1.3a port. 1x Micro SD card reader; 1x Internal Microphone and 1x Stereo Speaker. 2x USB 2.0 and 1x SD card reader. Integrated with G-sensor, light sensor, gyroscope, E-compass and GPS. ASUS Launcher, MyLibrary, MyNet, MyCloud, file manager and PC sync. 9.5 to 16 hours of battery life estimates based on specific media playback and usage patterns. The availability and the price of the Eee Pad Transformer with dimensions of 10.6 x 6.9 x 0.51-inch and weighs 1.49lbs are not yet announced.